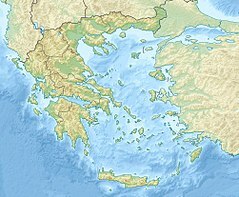 The 1978 Thessaloniki earthquake (Greek: Μεγάλος Σεισμός της Θεσσαλονίκης) occurred on 20 June at 23:03 local time. The shock registered 6.2 on the moment magnitude scale, had a maximum Mercalli intensity of VIII (Severe), and was felt throughout northern Greece, Yugoslavia and Bulgaria. It was the largest event in the area since the 1932 Ierissos earthquake. ^ 100+1 Years of Greece. Volume 2. Athens: Maniateas Publishing. 1999. pp. 210–211.